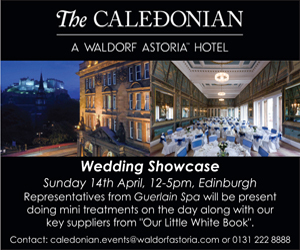 The Caledonian Waldorf Astoria Hotel – The ceremony was held in the Versailles Suite and the dinner reception in the Boardroom Suite. Jacci chose a trail with amnesia roses, schwarzwalder cala lilies, bear grass, lily grass and steel grass. Long table with 3 tall glass candlestands with taper candles, 3 goblet vases filled with bridal flowers and 3 footed vases also filled with bridal flowers. Little pots of flowers and tealights were placed around the table to complete the look. Bride’s Flowers: Sarah held a hand tie of vendella and amnesia roses. Table Centres: Tall silver candlestand with a sphere of amnesia & vendella roses, cream flowers and greenery.